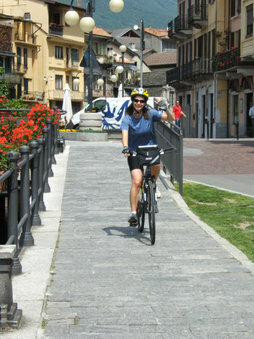 ...once again Bob and I cannot say enough about the bike tour that you gave us. And of course, your multitalented personality topped off the ride like delicious icing on the cake. We laughed, we enjoyed the view, we were happy tired, and just loved being part of the Tuscany gently rolling hills. Thank you again. Good Luck! and who knows you may be seeing a group from Mandeville, Louisiana this summer. Marco! The Tuscany tour that Jeri Elizabeth and I had with you was amazing. It was great riding in the rolling hills, seeing the scenery and hearing your enthusiasm, about your country. We found the bike ride to be very enjoyable and you made it memorable. When the ride became a little more challenging you said " Just a little more... or "No Problem-Just follow me". Thank you for your patience, kindness, and sense of humor because it made thr ride that more enjoyable. Since we have returned to Louisiana, we have been talking to our friends and showing the pictures we took on your tour. 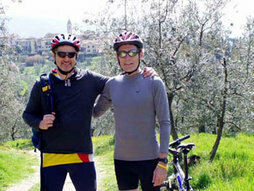 Several have expresses interests in visiting Italy and we have explained that no trip to Italy would be complete without including a "I Bike Tuscany" tour with you. Thanks for a great bike ride... My Friend! Laurie Frank, San Francisco, U.S.A.
Ciao Marco, since I returned from our personalized Tuscany bike trip, I've been bragging to everyone how it was the trip of a lifetime. Thanks so much for working so hard to make it an ideal trip for us. You can't beat having delicious food, great wine, amazing scenery, combined with all the private tours and wine tasting that you organized, while staying in the most beautiful villas. I was so glad we did a personalized tour with you which enabled us to see Tuscany from local's perspective, instead of the one of those group tours that herd tourists around with little flexibility. Thanks for taking such good care of us, and putting in so much effort to ensure that our trip was unforgettable! Denise & Paul Solomon, Pennsylvania, U.S.A. Thanks so much for the Tuscany ride... we had a wonderful ride and the scenery is beyond words. 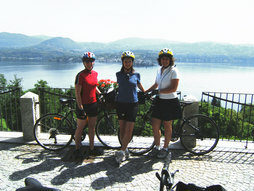 We would never have been able to see those parts of the Tuscany countryside without this bike tour. We especially enjoyed our time in Vertine. We enjoyed your company too, and appreciate your patience with us. It was a hard but fun day, well worth the effort. Thanks again! we had so much fun! Thanks a million! 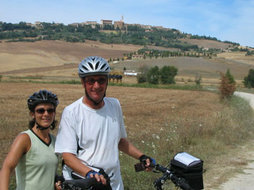 Sue and I wanted to write to let you know how much we enjoyed the bike/winery tour. It was a wonderful change of pace from all of the museums in Florence, and we really had a great time riding our bikes and touring the winery. We will certainly recommend you to any friends or family that are planning a trip to Florence or Tuscany in the future. Please also let Linda know how much we appreciate the history she gave us about Florence, as well as the opportunity to take pictures from Piazale Michelangelo.